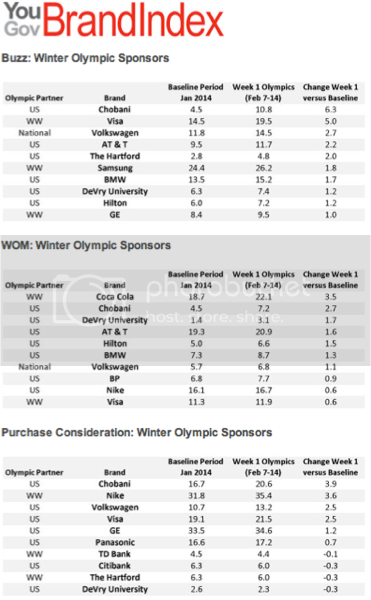 Despite the political angst and looming threat of terrorist threats, according to YouGov's Brand Index several sponsors still managed to make a big impact in Sochi. Note that these sentiment scores were published last week and are not final as the games just concluded this past weekend. Perhaps most interestingly though, despite the controversy over Russia's anti-gay laws, the Index reports LGBT perception of most official sponsors moved in a positive direction during the games, with the biggest gains from Volkswagen, Chobani, Coca Cola and United Airlines.